This post is part of documentation of HoloLensARToolKit, version v0.2. 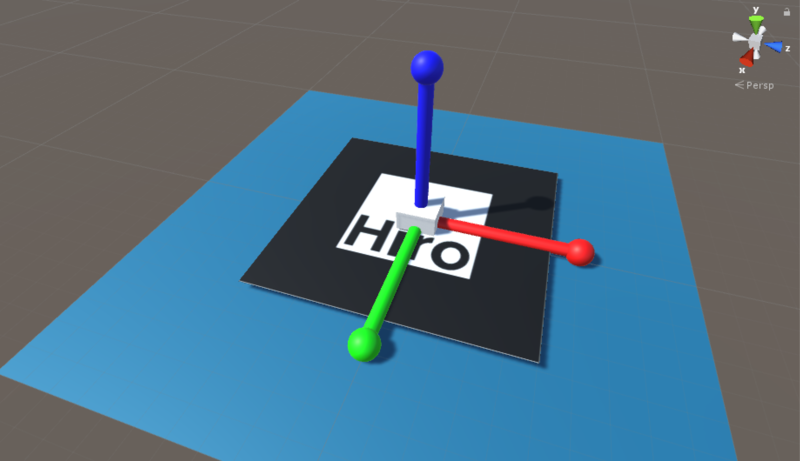 The documentation for the coordinate system in HoloLensARToolKit v0.1 is here. 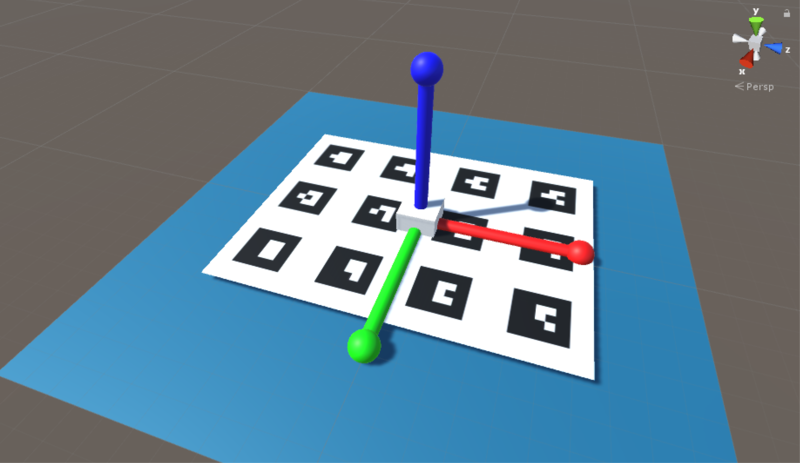 Unity3D uses left-hand coordinate systems to define transformations. The above is a screenshot of a Unity transformation. The x, y, z axis directions are visualized with different colors, and are following left-land rules. In addition, rotation along axis is applied clockwise, unlike counter-clockwise in right-hand coordinate systems. If you are accustomed to right-hand coordinate systems as I do, please pay more attention when working with raw 4x4 matrices. ARToolKit uses right-hand coordinate systems. Since OpenGL is right-handed as well, it is very comfortable to visualize the tracking result of ARToolKit by OpenGL. that converts the tracking result of ARToolKit to Unity environment. It took me a while to figure out the complicated conversions happened inside ARToolKit, inside Unity, and in-between. Actually in HoloLensARToolKit v0.1, the coordinate system is not very clear nor consistent between different kinds of markers. 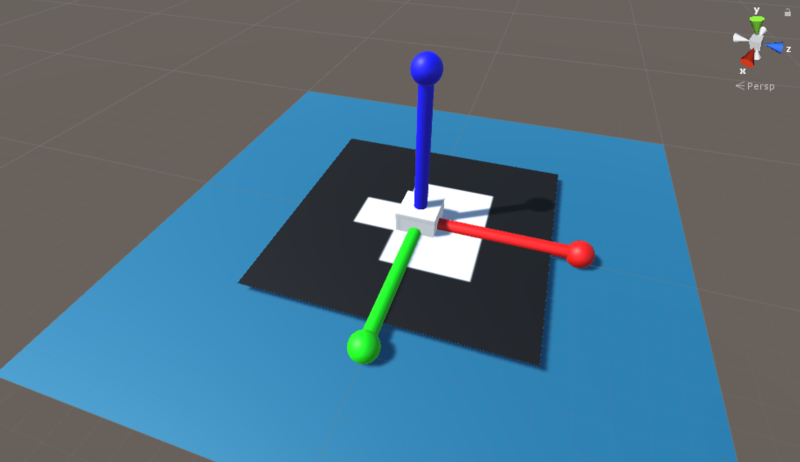 In the current version v0.2, the design of coordinate system is improved, and a special Unity scene is designed to help visualize the coordinate system associated with the marker. In this project, the tracking result is converted into left-handed coordinate system, with y-axis flipped. This is performed in the function ARUWPUtils.ConvertARUWPFloatArrayToMatrix4x4(). When the tracking result is applied to a Visualization Target of the current marker, there is no need to worry about any conversion. The following examples show the coordinate system associated with each kind of marker. Hiro marker and Kanji marker are examples of single pattern marker. They are defined using binary files. the transformation from the multi-matrix marker to individual matrix marker. Multi-matrix marker is useful for robust tracking, thus is much more useful for accuracy-critical augmented reality applications. Iterative Closest Point (ICP) algorithm is the underlying method for the fusion of tracking information. In HoloLensARToolKit v0.1, users need to adjust the multi-marker configuration file provided by ARToolKit, like this, to make it work with HoloLensARToolKit. Starting from v0.2, this step is not needed. The multi marker configuration file of ARToolKit and HoloLensARToolKit is EXACTLY SAME, which means, the description of multi marker is actually using right-hand coordinate system. You can access more articles describing the implementation details of HoloLensARToolKit in my blog, simply clicking on the tag: hololens-artoolkit. This post is part of documentation of HoloLensARToolKit, version v0.2. The ARUWPController options documentation for v0.1 is here. ARUWPController.cs is one of the main scripts used in HoloLensARToolKit. In this post, the options of this script are listed and discussed, along with common usecases. Each Unity project using HoloLensARToolKit package must and must only have one ARUWPController component. ARUWPController is very similar to ARController in ARToolKit, one of the major difference is that ARUWPController targets only at Universal Windows Platform, while ARController also handles Android, iOS, standalone and even editor. Therefore, ARUWPController has fewer attributes than ARController in general. This field specifies the name of camera calibration file, contained in the path Assets/StreamingAssets/. The camera calibration file must be ARToolKit format. It is a binary file, instead of XML or YAML for OpenCV. Please refer to HoloLens Camera Calibration project for more details. This field configures what kind of marker does the detection algorithm look for. If pattern markers only, e.g. Hiro or Kanji, then AR_TEMPLATE_MATCHING_COLOR or AR_TEMPLATE_MATCHING_MONO is enough. If matrix marker only, e.g. 3x3 code marker, then AR_MATRIX_CODE_DETECTION is sufficient. If there is need to detect both kinds of marker, then AR_TEMPLATE_MATCHING_COLOR_AND_MATRIX pr AR_TEMPLATE_MATCHING_MONO_AND_MATRIX must be chosen. This field is looking for a Unity.UI.Text object to print out tracking frame rate. It is very useful for debugging, or inspecting the performance of the application. In the sample scenes provided by HoloLensARToolKit, this text field is at the top-right corner for the user. Because it is not a required component for tracking to run, this field can be left blank. Similar to Track FPS Holder (optional), this field is optional, and is able to visualize the frame rate of rendering of the application. The rendering here means the refreshing of the whole application, but not the refreshing of video. The percentage of border of the marker, by default, it is 0.25. For example, in a 80cm width marker, the border is 20cm (25%). It configures the color of the border of the marker. AR_LABELING_BLACK_REGION is the default. The mode of image processing, by default, AR_IMAGE_PROC_FRAME_IMAGE is chosen. When the mode is AR_IMAGE_PROC_FIELD_IMAGE, ARToolKit processes pixels in only every second pixel row and column. This is useful both for handling images from interlaced video sources (where alternate lines are assembled from alternate fields and thus have one field time-difference, resulting in a “comb” effect) such as Digital Video cameras. This field appears when the Thresholding Mode is set to AR_LABELING_THRESH_MODE_MANUAL. ARToolKit first thresholds the grayscale image before corner extraction. It is easy to understand that the value applied here will be used as the threshold to obtain black and white image.